Situated in tranquil Villarabout, this 3 bedroom property presents a breathtaking interior finish of the highest standard; expertly designed to offer a beautiful, sleek finish with elements of alpine style incorporated throughout. It is laid out over three floors, and is comprised of an entrance hall, a double garage, 2 ensuite double bedrooms, a master bedroom with spacious ensuite bathroom and balcony, a large terrace, a beautiful, open plan living area leading out onto a balcony and a fully equipped kitchen. Its location in Villarabout- which sits just 1 km from Saint Martin de Belleville and offers a free ski bus, makes it perfectly suited to enjoy every aspect of the alpine lifestyle. As you enter the property on the ground floor, you will find an entrance hall featuring a stunning, bespoke staircase, two good sized double bedrooms complete with ensuite bathrooms, and a double garage of 50 square metres. On the first floor sits the stylish master bedroom with access to its own private balcony. The master bedroom boasts a very spacious ensuite bathroom complete with a freestanding bath, walk in shower and double basin vanity unit. On the landing of this level are built-in cupboards, offering a discreet and well-designed storage solution. The first floor also has access to a large terrace above the garage, which makes for a brilliant space for lounging in the summer and entertaining. On the top floor, beneath a magnificent ceiling of stunning wooden beams, you have a large, open plan living and dining area with fireplace. The floor to ceiling windows comprise bi fold doors which lead out onto a balcony and its scenic, mountain views. This space is also comprised of a fully equipped, high end, contemporary kitchen, offering the handy feature of being able to hide it away with folding cupboard doors for a clean, tidy finish. With its incredible interior finish and ideal location, this property is a real gem on the market. 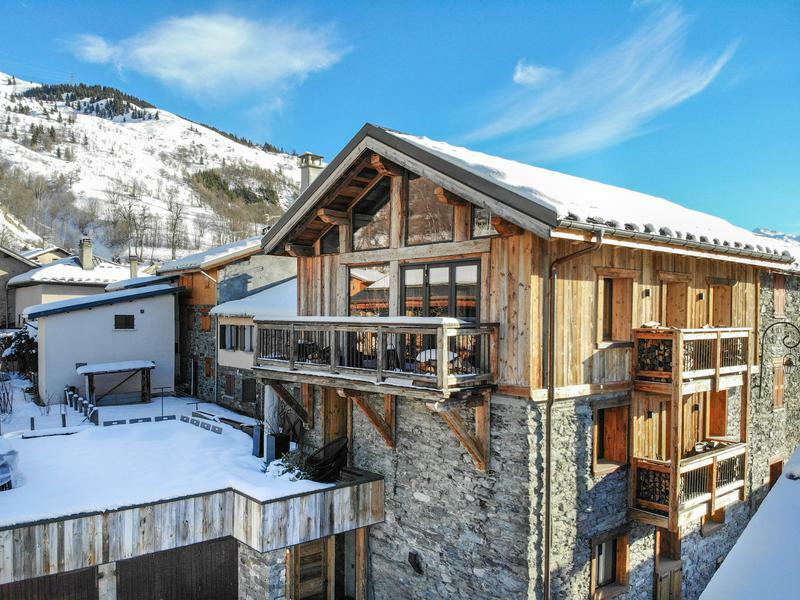 Within short distance of Saint Martin and its direct links to the renowned 3 Valleys ski area, it would make for a fantastic, luxury ski property, as well as a great place to enjoy what the sunny Belleville Valley has to offer in the summer time too!